We have seen that what is struts and how it works. I will guide the new developer, step by step to create the login application using struts 2 in this article. Step 1 : Download the struts jar file or sample application from the official struts website. Step 2 : Create a web project for jsp and open web.xml. In web.xml add the following lines of code in between <web-app> tag. Above configuration declares FilterDispatcher for struts 2 which is boot strap component for your website. Step 3 : Copy all the jar files of struts 2 application downloaded in Step 1 into lib folder of your application. As you can see in above configuration, I have included other configuration file named “Login.xml” Instead of writing all the configuration in single struts.xml , we can split the xml configuration file and include in main struts.xml. I will explain the creation of file “Login.xml” later in this tutorail series. Step 5 : Now create a jsp page in folder “pages” under WebContent folder with Name “Login.jsp”. Step 6 : Create one Model Class, where the logic is written to validate the User. Here in this series no database is envolved. We have simply hardcoaded the tutorial for easy understanding of the concept. Step 7: Now create the Action Class. Every Action Class extend the Class “com.opensymphony.xwork2.ActionSupport“. There is no compulsion on extending the ActionSupport class, and not necessary that only execute() method works. Any method, which return string can work. That’s the powerful feature of new Struts 2 framework. But if we will not extend “ActionSupport”, then we will miss much of the default capabilities of Struts like Validation features. Variable name must be same as expected request parameter name with getter and setters. In this case we expect two request parameter named uName and pwd. Any String result can be returned from execute() method of the struts2, but it is recommended to return the standard defined result like SUCCESS or INPUT. 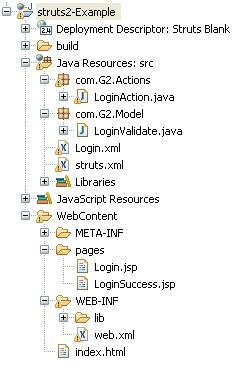 Step 8: Create configuration file which is included in step 4 of name “Login.xml”. Instead of creating this file, we may also add the code lines in struts.xml, but it is good practice to have the separate xml file of separate modules in application. Package in Java used to group together similar type of class. In struts 2, package tag is used to group together similar types of actions along with interceptors. The action “LoginAction”, may return two types of result, either “input” or “success”, depending on that the view is decided. Instead of writing “jsp file path” in <result> , it is recommended to write the action, so that in future, if the page name changes then instead of changing jsp file path everywhere, we have to change only tag. Note here, “type“ attribute is introduced. There are many result types available in struts. In “Chain” result type, the next action class gets request object with all the parameters of the previous actions class whereas in “redirectAction”, new request is generated and therefore next Action class will not get the previous request and its parameters. This Example is very easy to understand as a beginner.It helps me a lot to clear the flow of application in Struts2. Nice tutorial using Struts 2 with good images. I have a Basic Struts Login Application program using Strus1.2. I think this will also very helpful to your blog followers.